To learn, I require a stable point with which to draw references. As previously explored, there are aspects of education where certain parts of the material are taken on faith to be inarguably true — these are the stable points. The structure of education yields the structure of the society I am in; a reductionist hierarchy that repeatedly falls victim to the classic trap of enumerating the world. the structure of knowledge trains people to see the world a certain way. It amplifies its own structural biases in their perception of what is possible, and decides for them at the outset what is allowed to happen. Knowledge must be validated, organized and directed to some purpose. It has to be managed before it can be acted upon. The organization of that knowledge — that structure — will either enhance or inhibit the structure of the resulting system. 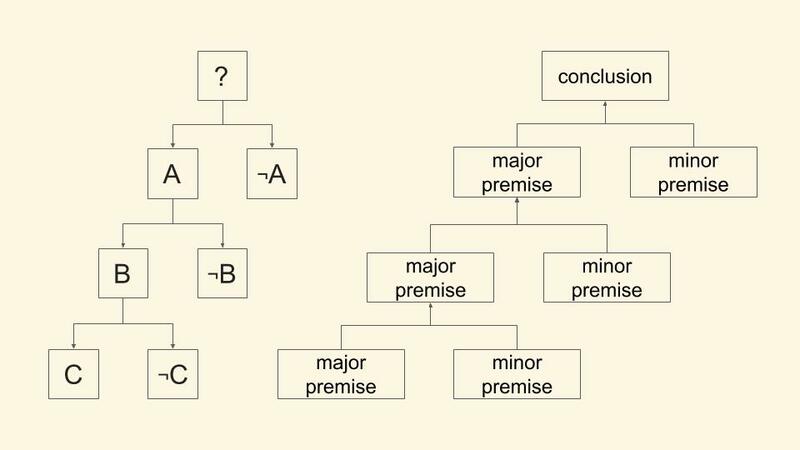 The stable points of reference I draw upon in this article regarding The Structure of Knowledge, are specific works of Stafford Beer: the father of Management Cybernetics. This article is inspired by his lectures and though it is in my words and expressed through my understanding, a part of its theme is drawn from his own presentations. The purpose of which is not to duplicate or to supplement that work but to inspire you to investigate his works more thoroughly on your own. I’m trying to get you to look at this in an historical perspective, not because I’m an historian or it's interesting, but because I want to demonstrate how, thousands of years and certainly hundreds of years, [this] has made us look at the world in the way we do and therefore ‘organize’ things in the way we do. The branches of science are Natural, Formal, Social and Applied. Branches lead to yet more distinctions branching off them which have come to be known as disciplines. The practitioners of these disciplines use specialized language, and as a result for hundreds of years they have known comparatively very little about what the others are doing. Encyclopædia Britannica tells me: “Aristotle was the first genuine scientist in history ... [and] every scientist is in his debt”. Unless I define history to be, narrowly, that part of the past for which there is a surviving written account, this assertion is debatable. However, if I look back to the 4th century BC, I find him explaining his principle of noncontradiction, which says that a thing cannot both “be” and “not be” at the same time. That is, I find him investigating the nature of things by dividing them up into categories between A and not A, between B and not B, between C and not C, and so on. This process can be repeated indefinitely and as I look to the left-hand side of the following diagram I can see that the process results in an inverted tree-like structure. I can see too that the criteria for categorization, is arbitrary, but I ultimately hope and strive for rational divisions between these categories. Paired with this principle of noncontradiction, which is a process for constructing or “unfolding” knowledge, he also discusses a process for reasoning, a process for dissecting or “folding” knowledge — the syllogism. Now, how do I go about reasoning, Aristotle? His famous example explains, starting with a major premise: “All men are mortal” and a minor premise: “Socrates is a man”, and concluding with “Socrates is mortal”. The syllogism became the way in which the society I am in was told to reason: I take this premise, and I take that other premise and from them I deduce. Now, to deduce means to draw a logical conclusion, reasoning by deduction. Deduction means to make a subtraction. Now, this language I use has evolved these terms either to hold confusing contradiction or something profound is hiding in them. From two premises I am to “take away” or “reduce” something and I am left with the sorites. Which is the whole structure of this tree-like thing. Something that appears to be more or is it really less than what I've started with? The structure is depicted on the right-hand side of the previous diagram. Many people a very long time ago set out to create a science to describe the world and they began with this sort of thing as the basic process; what they’ve ended up with is an “intellectual shape” to mimic the world that embodies the same structure as the process which created it. This is how they get the branches of science in the first place. Science is distinguished by Natural science, which is not Formal science, which is not Social science, which is not Applied science, and so on. Continuing down through the following ranks, creating distinctions as premises and drawing conclusions with them. The structure of knowledge shapes the structure of this society I am in. Take for instance Theology and its unknowable mystery: God. How would they confront that mystery? Apart from the myriad ways it has been done, they all tend to develop the same pattern. As a particular example, working upwards, they begin with people at the bottom - doing all the work. Above them, they have guardians, angels, archangels, principalities, powers, virtues, dominions, seraphim, cherubim, thrones and finally: God. What about a religion based on this theology? No problem, just follow the same recipe again. The people are working at the bottom. Above them they have, deacons, priests, bishops, archbishops, metropolitans, primates, cardinals, major archbishops, patriarchs, the Pope and finally: God. 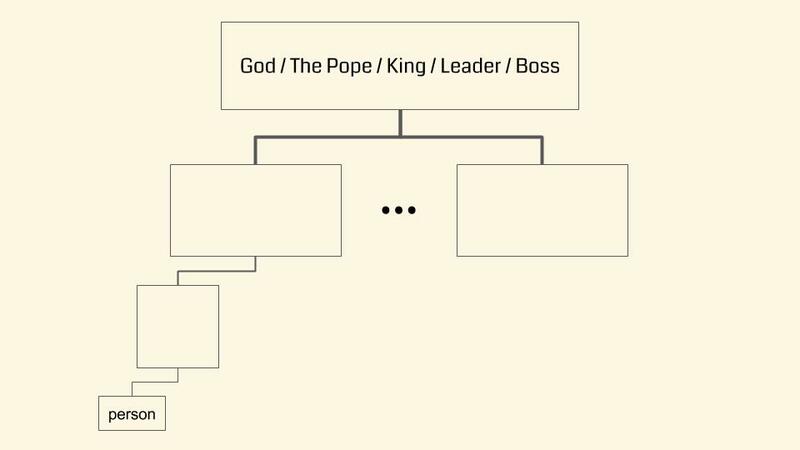 This hierarchy, in fact is where the word hierarchy itself comes from which is why this particular example was favored. How about a society, something older than Aristotle perhaps? Look at the structure of ancient Egyptian society, at the bottom you have the people - working. They are organized into castes, the workers, farmers, builders, soldiers, craftsmen, artists, merchants, scribes, engineers, doctors, officials, social elite, priests, vizirs, pharaoh. Maybe I’m still not convinced this thing permeates everything done collectively as human beings, so how about looking at something more modern? Look at the organizational chart of a company. Look at Governments, which are just a special case of management. As a result we have institutions, departments, universities, filled with people in their narrow discipline with highly specialized vocabularies and many of them can't even communicate effectively with each other nor I with them. Is this all fine and good? Isn’t the principle of noncontradiction just common sense? Even this doesn’t seem to be the definitive case. The classic example is from Epimenides of Knossos, Crete in 600 BC who said: “Epimenides is a Cretan, all Cretans are liars”. And according to Hericlitus, “We step and do not step into the same rivers; we are and we are not”. Aside from early philosophy surely noncontradiction holds true to the physical universe? In 1935 Einstein, Podolsky and Rosen investigated superposition in quantum mechanics, whereby a physical particle is in a multiplicity of states at once. In 1963 Bohr’s principle of complementarity demonstrated the insight that quanta can behave as though it is both a wave and a particle and is deemed to be as such through the method of observation. What about logic itself? In 1931 Gödel demonstrated his incompleteness theorem which proved among other things that while noncontradiction cannot be disproved in formal logic, it cannot be proved either. Is the embrace of reductionism and noncontradiction a limitation of the human mind that we just have to live with? The human mind is a conscious system in which self reference appears to play a significant role. Self-reference defies noncontradiction. This defiance is called paradox. For example, self referential sentences were amusingly explored in Hofstadter's 1979 book “Gödel, Escher and Bach”. Consider the sentence that refers to itself: “This sentence is false”. Is this sentence true or is it false? It appears to be both, perhaps that is just because the sentence is actually meaningless. In that case, try this one instead: “Everything I say is wrong”. Issues of exact simultaneity being irrelevant here; consider two people observing the same thing at the same time and drawing distinct conclusions. This happens all of the time in “the real world”, particularly in politics. These examples seem to violate the principle of noncontradiction. While the principle itself is seemingly common-sense, it doesn’t stand up to detailed analysis. It fails this analysis because human consciousness fails it, you see, the world isn’t entirely objective it is subjective as well. It is both these things at the same time. Hopefully, it is fairly clear or soon will be that this intellectual model is used to organize the world and results in a world that very much resembles the shape of the model. It is a model, something produced by human thought and not the world itself. Yet it is a self reinforcing structure that has trapped us. Because once this organization principle pervades all aspects of society, and society itself mimics its structure, anything else is out of context. It no longer makes sense for people to reason outside of it. I am trapped inside the model. There are aspects of systems, their emergent phenomena, that cannot be captured by the reductionist approach. Imagine you begin taking apart your computer. You get the components all spread out, labeled and neatly organized. How absurd would it be to ask, then: “Which of these parts is the FLOWETH One Life Catalog that I was reading just moments ago?”.